Travelers enjoy great deals – I for sure do! When I first set out to travel and live in Southeast Asia I got a miles flight to Hawaii (where I have many relatives) and then I camped out in Honolulu until I found a great last minute flight into Bangkok. Since I wasn’t on a tight schedule or an organized itinerary, I had the flexibility to wait until I got a good enough deal on airfare. When that deal came, I jumped at it and shortly thereafter I was wandering the streets of Bangkok! 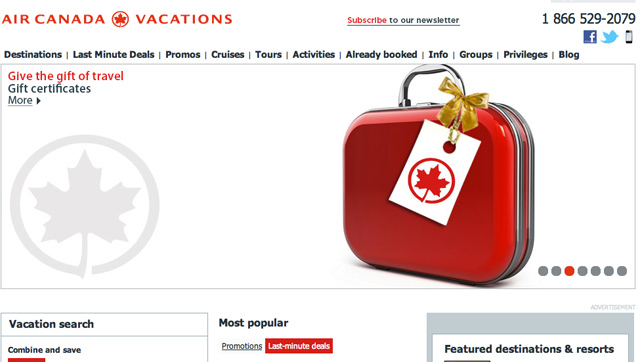 While checking out Air Canada Vacations website, I got that feeling of excitement that always comes with booking a flight and the anticipation of taking a vacation. Air Canada Vacations is a Canadian tour operator that specializes in leisure travel packages and promotions. In 2010, the company received an award as the “Favourite Tour Operator” at the Baxter Travel Media's Agents' Choice Awards. 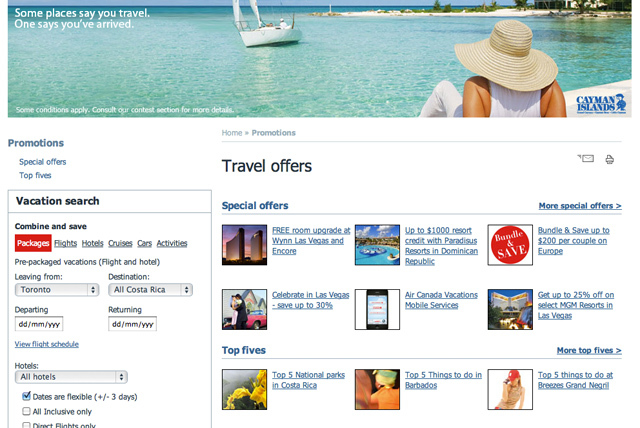 Associated with Air Canada (the leading airline of the country), Air Canada Vacations is a reputable travel resource. 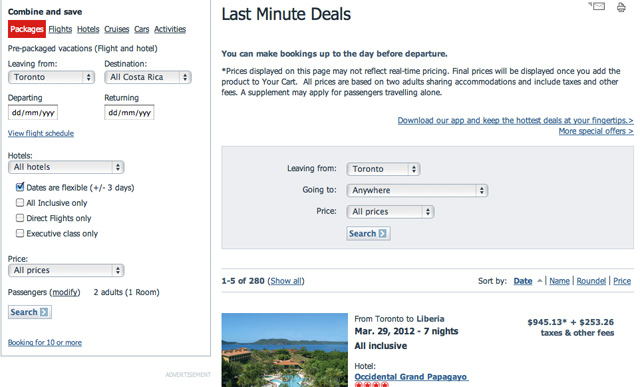 One of the most useful features of the site is the last minute deals search. For last minute vacation package savings you have to be willing to fly out of one of Canada’s major cities and also be willing to abide by the dates specified. Since Air Canada flies directly to many destinations in the Caribbean, it seems that a lot of the vacation promotions cater to people that love tropical weather and sunny beaches. After clicking through a few “add to cart” and “checkout” buttons you finally get the total cost of your trip – this package came out to $1,542.80 for two people. In my opinion, it’s not a bad price considering it includes airfare (which can be really expensive to Hawaii) and accommodation. Of course, you do need to be flexible with your dates and time the flights leave and land. The great thing is, you can book last minute deals up to the day before the departure date – so if you have a spur of the moment vacation, it just might work out! Booking travel vacations online can get a little confusing so make sure you read all the fine print and check out all the final costs of everything. You don’t want to get to the end of booking a steal of a deal only to realize that it’s not as good a deal as you thought. One thing that’s always a little frustrating is having to click through a number of links to finally see the final price. When you click on the “Promos” tab, you’ll find a selection of travel offers like room upgrades, discount savings and special deals. Depending on the specific place you intend to travel, you can attempt to search for a deal that will suit your interest. Some of the deals looked decent, while others were less attractive. You'll have to do some research and reading to really see what specials are worth pursuing. If you are living in a major city in Canada, have a decent amount of savings for a flight and leisure vacation of this style, and have the flexibility to fit a trip into your schedule, you may want to check out the vacation deals offered by Air Canada Vacations! Mark was raised in central Africa before migrating back to the US for University. After graduating, he decided to continue traveling the world. On Migrationology, he shares the cultural side of travel from a slow paced local perspective that often revolves around his love for eating all forms of food. Join him on Facebook, follow him on Twitter @migrationology, and add him on Google Plus.